Here are the 42 quests linked to shrines which, as their name say it, allow you through a puzzle to access one of the 120 shrines. In Kakariko Village, after going through all the local missions, go see Impa to see that the orb is gone. Paya says that the thief is maybe not far off and asks you to be careful. If you have already seen a pedestal in Kakariko's vicinity, it's the place to go. Aim for the forest east of the village and hide behind a tree while looking at the pedestal. Around midnight Dorian arrives from the bridge's side and catches sight of a Yiga, then the latter spots you. Fight him, pick up his Windcleaver, then after Dorian has confessed his past deeds, take the orb and place it on the pedestal so the Lakna Rokee Shrine emerges from the ground. In the northwest part of Necluda, on the Floret Sandbar, where Hylia River splits in two, talk to Magda who asks you not to step on her flowers. To reach the shrine you only have not to step on the flowers all around the Hila Rao Shrine or you'll have to face Magda's wrath. Once in front, jump above the red flowers. In Hateno Village, talk to Clavia on a pier. Solve the riddle: "When the three summit trees become one, turn your back to them and head toward the sea. A trial encased in stone awaits you there". Clavia adds that this points to Afromsia Coast. While wearing warm clothes and having cooked a meal against the cold, climb Lanayru Mountain (going between Madorna Mountain and Walnot Mountain) towards a cleared area with some trees. 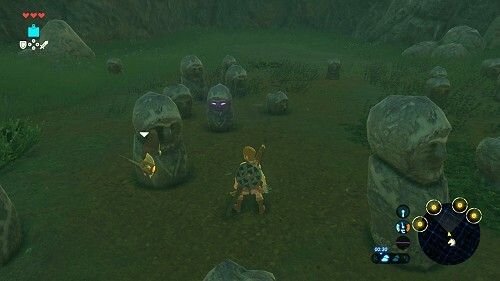 Look for a group of rocks standing out, drop a bomb and the Tahno O'ah Shrine reveals itself to you. Talk to Medda in his field in Hateno Village. He tells you about a treasure hidden at the Spring of Wisdom. On Lanayru Mountain rising in the north, a princess used to preside a purifying ceremony at this spring. Wearing warm clothes (Warm Doublet or better) and having cooked at least one meal against the cold (5 peppers), climb to the top of Mount Lanayru until you reach the Spring of Wisdom (look for a pond on your map). Once you're arrived, the Goddess statue asks you to save the dragon Naydra, the Blue Spirit of Lanayru and guardian of the Spring of Wisdom, serving the Goddess. Destroy one of the yellow eyes on its body, then when it takes off, climb as high as you can and shoot at another eye. Then, use the Paraglider and the wind currents to follow it and destroy the other eyes. Once it's saved, the Goddess says to stick an arrow into the dragon's body. 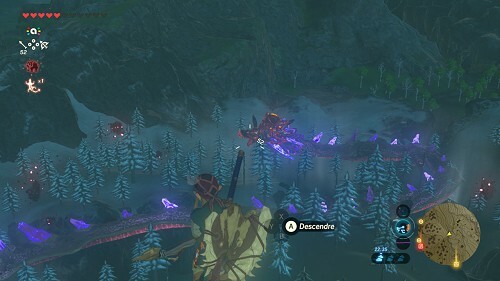 Do so to get a Naydra's Scale, then drop it into the spring, which opens the way to the Jitan Sa'mi Shrine. Next to Fort Hateno, talk to Calip in his cabin in the woods and call him Doctor. Solve the riddle: "When a dark light resides in the cursed statue's eyes, pierce its gaze to purge the seal from the shrine". From his house, go east and when the path splits, go left. You reach a clearing with many small statues. At night, one of them has purple eyes. Shoot an arrow at it, which will make the Kam Urog Shrine appear. In Rabia Plain (in the north part of East Necluda), talk to the singing Rito and ask him to sing. Solve the riddle: "A beast that wears a crown of bone, Prancing through the lush green. Mount the beast upon its throne, For only then the shrine is seen.". Walk south, you should see a beautiful deer. Keep going on without running, then crouch, mount the deer and immediatly calm it several times. 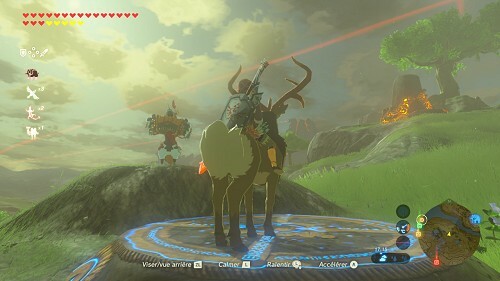 Then go to Kass and stand, still riding the deer, on the pedestal. The Mezza Lo Shrine appears. 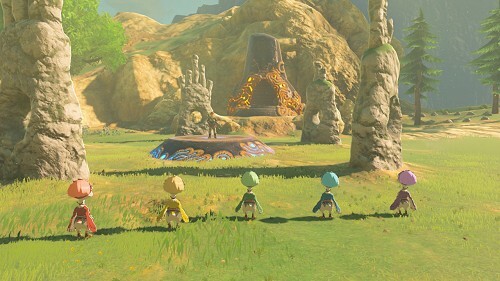 [After you've calmed Vah Ruta] At Zora's Domain, talk to the two children in front of Mipha's statue. Solve the riddle: "A gift from the sky... A scale of light... Splits the feet... Of a Veiled Falls sight... Your trial awaits... It's glowing bright..."
Go on the west bridge and talk to Trello at the end of the bridge. He says he lost the ceremonial trident by dropping it off the bridge and this trident might be useful to solve the riddle. Go under the bridge, use Cryonis to get close to the trident and use Magnesis to get it back. Then go to Veiled Falls and climb it thanks to the Zora Armor. 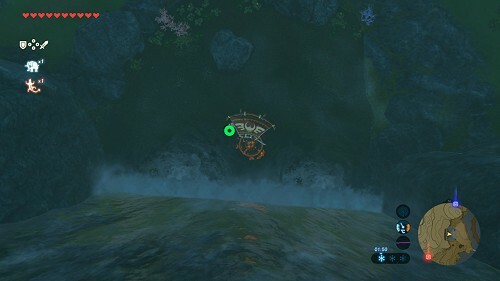 Then jump with the Paraglider and once at 1-2 meters from the pedestal in the water, perform a jump attack on the pedestal. The Dagah Keek Shrine then appears. In Horon Lagoon (Necluda Sea), talk to Kass and ask him to sing. Solve the riddle: "He breaks the rocks that serve to bind, Above the tempestuous bay. On wings of cloth and wood entwined, He lands on the altar to open the way." Head towards the big structure of high rocks which form a U southwards. Using bombs, destroy the pile of rocks located to the east, as well as two other rock piles to the west. Then, go back to the structure in the shape of a U and look for a rock sticking a bit off this structure. Climb, stand at the bottom of the U, drop a bomb from the top and quickly make it explode. (You can also stand south of the structure and shoot a Bomb Arrow at the rock sticking off.) Then, from the structure's top, face the pedestal which got activated, let the wind carry you, and land on the pedestal. The Shai Yota Shrine emerges from the ground. In Eldin Canyon, at Foothill Stable, inside the tent, talk to Mayro in front of the painting. He says that this landscape was supposedly painted south of this very stable. Take a closer look at the painting to notice a shrine on the left. From this painting, find the shrine back (advice: take a picture of it). Once the Tah Muhl Shrine was found back (thanks to the detector), activate it to finish the quest. [After you've calmed Vah Rudania] From the beast, fly from one mountain to another towards the east then the north, then fly north and land at Gut Check Rock. 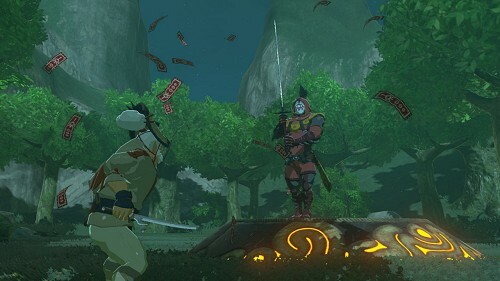 Get close to the shrine and talk to Bayge who tells you that you're at the Goron training ground and that you have to go through the Gut Check Challenge. Pay 20 rupees to take part of the challenge. 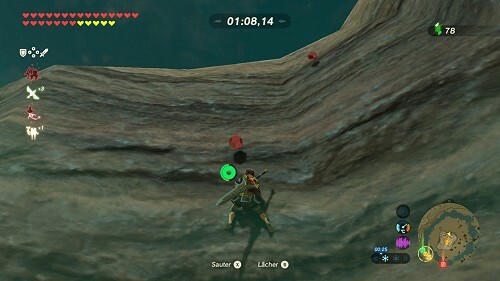 Wear two or three climbing pieces of clothing if you own them, or else have at least two stamina vessels, then climb the rock in less than 3 minutes while picking up the rupees along the way. It's not necessary to pick them all, have some breaks on the black platforms where you can often find big rupees. The north wall of the cliff holds quite a few red rupees. After making it, the Goron lets you get in the Gorae Torr Shrine. In Goron City, talk to Bladon who worries about his brother gone to Gorko Tunnel, southwest of Gorko Lake, to dig up the secret of the hero. Go there and look for a tunnel's entrance. Talk to an exhausted Gonguron, then Bladon arrives and asks you to bring back a Rock Roast for his brother. Go down the path and fight all the Moblins you'll meet until Gortram Cliff. 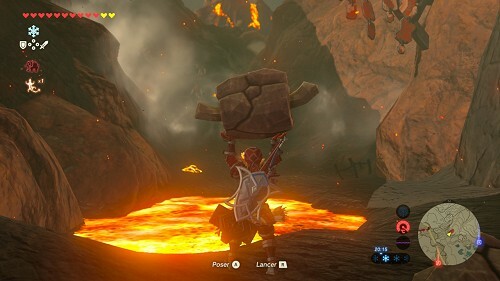 Leave the Roasts there for now, go back up the path while getting rid of more Moblins, then go get a Roast and bring it to the two Gorons. After eating the grilled roast and feeling better, they start digging the rock and find the Kayra Mah Shrine. At East Akkala Stable, talk to Nobo, a young woman who knows the fountain and the Spring of Power located to the west. So aim west until you find the Spring of Power. Get close to the goddess statue and pray. She asks you to offer a scale of Dinraal, the red Spirit, to the spring. Place a scale into the spring, then the door behind it opens and the Tutsuwa Nima Shrine appears. 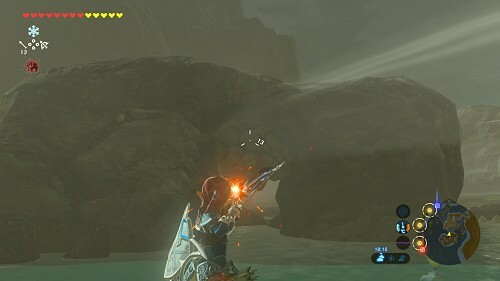 At the Rist Peninsula (in the eastern part of Akkala), on a hill near Malin Bay, read the stele saying that the ancient orb grants the right to the hero's trial. Lift the orb in the water, then go north and follow the spinning path until you reach a pedestal. There's a shortcut at the end since you can walk on the light blue parts on the map. Place the orb in the hole, which causes the Ritaag Zumo Shrine to appear. 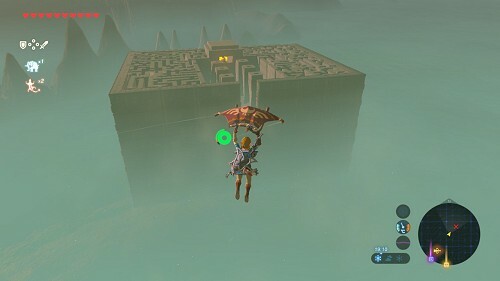 From the Akkala Ancient Tech Lab, fly to Lomei Labyrinth Island to the north, and go through the maze to the Tu Ka'loh Shrine. At Akkala's Ancient Tech Lab, talk to Jerrin who says to go see the left eye of Skull Lake (the highest) to find a shrine. Go to Skull Lake (to the west) and fly to the shrine on high ground from the cliff on its right. Enter the Zuna Kai Shrine. In the Korok Forest, southwestern side, talk to Zooki who says that "The hungry tree will show you the way. Spy their iron to win the day." You have to follow the trees having a metal orb into their mouth, then place a rusty shield with Magnesis into the mouth of the tree (the one with the stele) to make a chest appear. It then has to be placed thanks to Magnesis into the mouth of the tree in the middle of the islet to make the Kuhn Sidajj Shrine appear. More details in the walkthrough. In the Korok Forest, northwestern side, talk to Tasho, who asks you to follow his son Oaki without him to notice you. You have to follow him from afar but without losing sight of him. Oaki sometimes stops, looks behind or ponders. When he's reached the shrine, you can go forward without worries and enter the Daag Chokah Shrine. More details in the walkthrough. In the Korok Forest, northeastern side, talk to Damia who gives you a Forest Dweller's Sword, Shield and Bow that you have to keep equipped during the whole trial without breaking them or unequipping them. 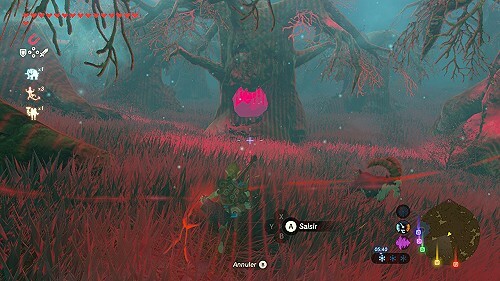 Go through the forest while destroying the enemies without using too much the weapons you were given, then once at the end, you can enter the Maag Halan Shrine. More details in the walkthrough. At the Serenne Stable, talk to Zumi who says that at Mount Drena, it's dark even during the day. Enter the Thyphlo Ruins from the west side. Pick up the torch next to the lantern, then go straight ahead, while lighting the lanterns along the way. Open the chest in front of you containing an Opal, then take a few steps back and go to your right (south). When you reach a stone pillar lying on the ground in front of you, go to your left to the east. 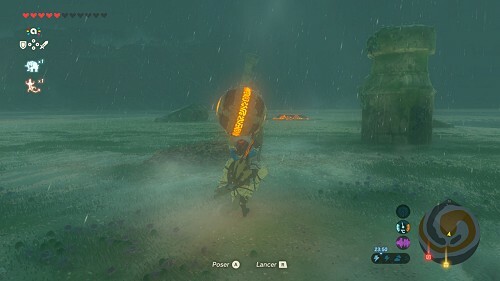 If you've put out your torch to fight, you can select a Fire Rod or activate Daruk's Protection to light your way. 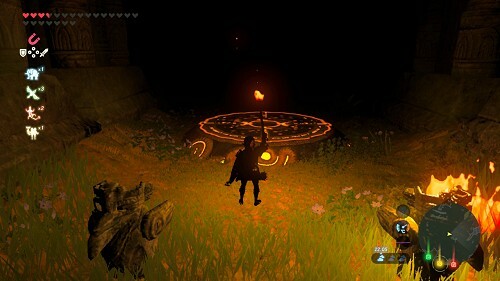 Once you reach another lying stone pillar, go left to the centre of this huge dark forest, and look for a sleeping Hinox with a light orb on his belly. Attack it, pick up the dropped weapons and materials, then lift the orb and look for a light pedestal nearby (that you may already have noticed). Place the orb on the pedestal, then go west where the Ketoh Wawai Shrine has appeared. In Rito Village by day, talk to little Molli who tells you that her grandpa saw a big white birdie from a tree located on very high grounds. Solve the riddle: "Once upon a time, my grandpa stopped at a big tree while he was climbing a big mountain and looked below him to the northwest. When sudently he saw a huge snow-white birdie with its wings spread wide! My grandpa took off flying after the snow-white birdie. And as he got a little closer to the white birdie, Grandpa saw something super important inside its belly!". 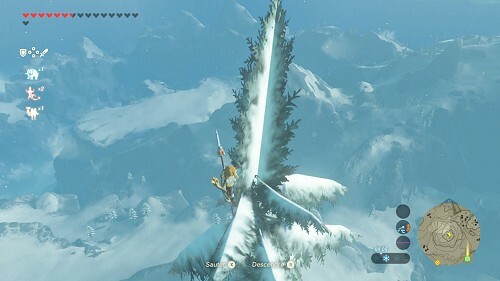 Go atop the mountain in Talonto Peak, climb at the top of the tree, then look northwest. You notice the mountain and the snow are shaped like a white bird. Jump and glide towards this bird, and before you reach it, you spot a red dot and an opening in the mountain Biron Snowshelf. Land, then go through this opening to reach the Mozo Shenno Shrine. [After you've calmed Vah Medoh] In Rito Village by day, talk to Bedoli on Revali's Landing. She forgot the rest of the song and sends you to ask her sister Laissa. Talk to Laissa in one of the houses and recite the first half. "pride", "pillar", "heart" and "sun". 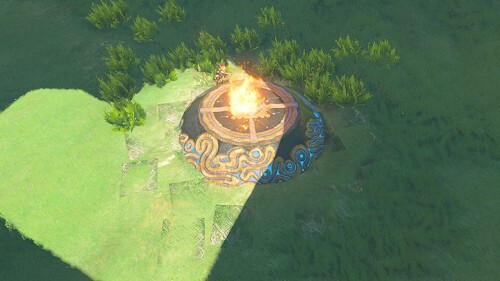 On Revali's Landing, around noon, look at the tower's shadow aiming at the pedestal that you can see to the south. Fly to this pedestal. At 1 PM a heart appears on the pedestal. Shoot a Fire Arrow at the pedestal before the heart is completly gone to make the Bareeda Naag Shrine appear. [After you've calmed Vah Medoh] Talk to Amali near the shrine who is looking for her daughter who maybe went to Warbler's Nest. Fly west and go there. Talk to Kheel who is waiting for her sisters for rehersal and asks you to go tell them. Go back to the village and talk to Genli in the kitchen who wants some Salmon Meunière. Go to the shop and talk to Cree who gives you some Goat Butter. You can also buy some Tabantha Wheat, but another sister can give you some. Then leave the village's main island and after the first bridge, talk to Kotts in the pond. She gives you the Hearty Salmon she fished. You still have to find Notts who likes to stand up high. Warp on Vah Medoh, then carefully go down on the shrine's side to find her. Talk to her so she gives you some Tabantha Wheat. Go back to the kitchen and cook the Salmon Meunière with the salmon, the butter and the wheat, then give it to Genli. Go back to Warbler's Nest, talk to the little Ritos to hear them sing: blue purple green red yellow, and talk especially to Kheel, who gives you a Korok Leaf. Stand on the pedestal then use the leaf to make the wind blow into the five statues in this order (according to the "fingers"): 4, 5, 3, 1 and 2. Then the Voo Lota Shrine appears. Thanks to LuigiTails60, Foxzeman and Mr_Meu!